They responded with, “Well, the movie looks like it’s about a love story,” and I realized that I might have thought so too, if I had read the book any earlier than I did . 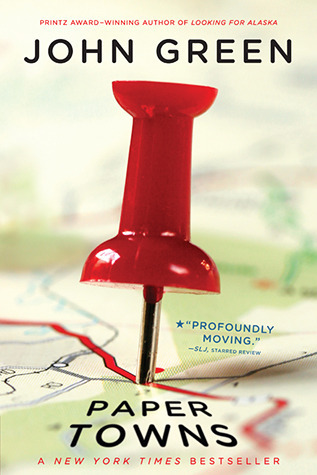 It’s been said that things often fall into place when they are meant to, not a moment before or after, and I believe this to be true about my reading Paper Towns. I would have certainly enjoyed the writing style and characters if I read it earlier, but I think I would have missed out on the more important aspects of the book. Today, I am much more aware of and interested in social psychology and the individual as a part of a larger group. I am fascinated by how ideas are generated and by creative thinkers and what makes them so. To me, this story is much more about our ongoing struggle to separate who we are from who our groups make us out to be, and our need to truly understand who the people that we think we know really are. For example, in Paper Towns, we meet a character who overcompensates his confidence because he feels rejected and another character who distances himself from those he likes the most because he his afraid of their rejection. We watch a character who has shied away from attention or conflict most of his life suddenly embrace and seek it out on his own because he is influenced by those similar actions in another character. We get to know a character who is revered (or despised) by others for her ideas and learn that those very ideas are a direct result of how those people have made her feel and believed her to be. John Green uses Walt Whitman’s Leaves of Grass and “Song of Myself” to help weave these characters in and out of one another’s lives and help us learn, throughout the book, the depths of their interconnectedness. We learn that these characters’ actions and feelings are all connected to and with one another. There are many moments when the characters themselves have glimpses of these same insights, especially at the end, but, just like in real life, they never fully seem to figure it out. 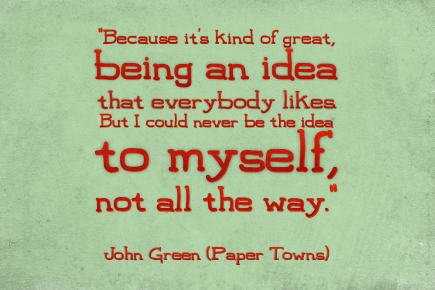 Paper Towns really isn’t a love story in the classic sense; it is a testament to what we each mean to one another, what we all do for and because of one another, and what we must try to do so that we can better understand one another and ourselves.